This is one of the few occasions that I am traveling Cambodia for work rather than pleasure, together with my Cambodian colleagues around the great lake. 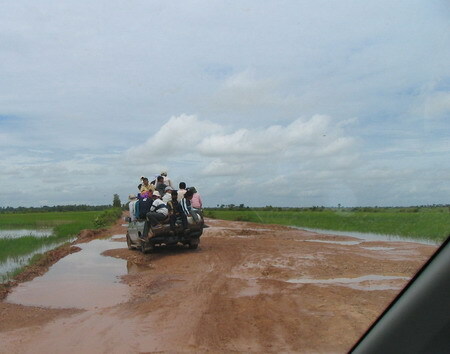 It is the first time that I am making a trip all around the Tonle Sap Lake. 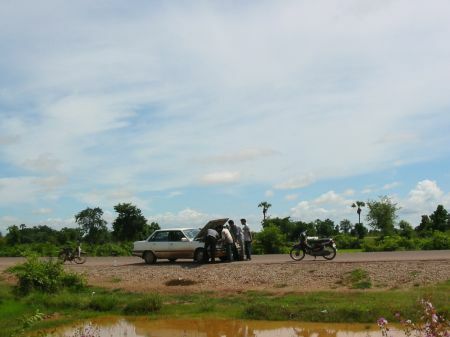 I tune out work related issues here and focus instead on impressions from the road starting from Phnom Penh via Kampong Thom to Siem Reap, Battambang and back to Phnom Penh via Kampong Chnang. 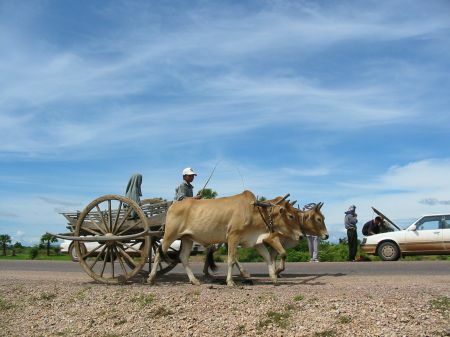 Only on Friday last week the chance came up to travel to Battambang, which is a province in the very west of Cambodia. I started to contact various Islamic organizations and our project translator was so kind to do the calls for me. 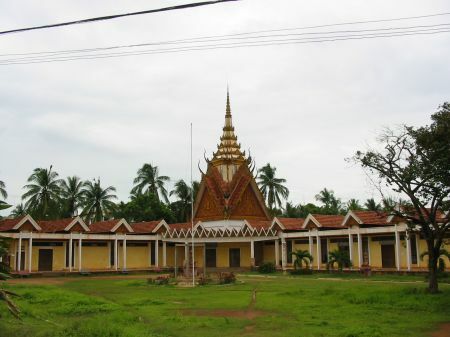 One of the few Muslim organizations listed in the (more or less official) directory of NGOs with operations in Cambodia was the Islamic Local Development Organization (ILDO), which is based in Battambang. I make this here a more private and travel related text and write a separate note about the Islamic encounter. 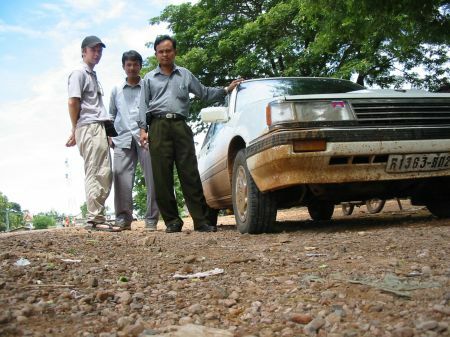 As it happens, our project translator grew up most of the time in Battambang and he offered to drive there on the weekend with his brother and in his brotherâ€™s car. Originally I wanted to practice my moto capabilities on Saturday. However, only later I realized that it is more than 300 km to drive to Battambang and, given the uncertainty we faced about the quality of the road (which depends critically on whether or not it rains) and the certainty about the anarchic state of traffic affairs we decided to dedicate the entire weekend to this trip. This is how we travel this time. This is â€¦ yes, a Toyota Camry. 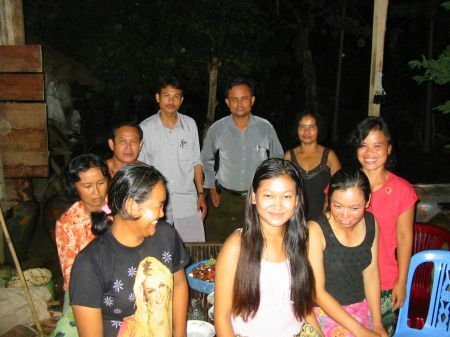 The person in the middle is our project translator. He is 34 I believe. The guy next to the car is his older brother, the driver of the car. Both have been working hard and with significant success. 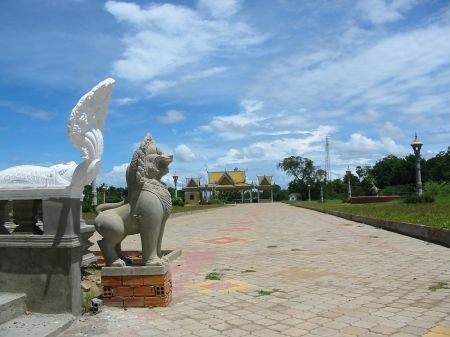 The older brother has attended a government educational institution with high prestige in Cambodia and has gotten a favorable position in the hierarchy of the current administration. The younger brother went to India for about six years of his live and got both a bachelor and a master degree in public administration and international relations at an institute with international reputation. The car has the steering wheel on the right side. 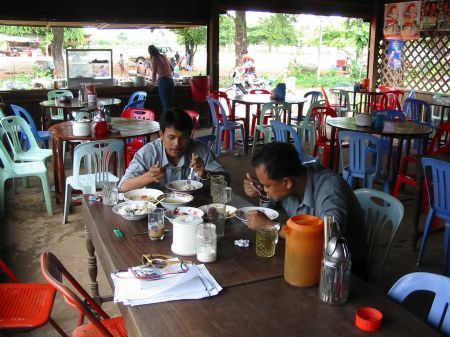 We started early and stopped in a village after about 40 km outside of Phnom Penh to have some breakfast. 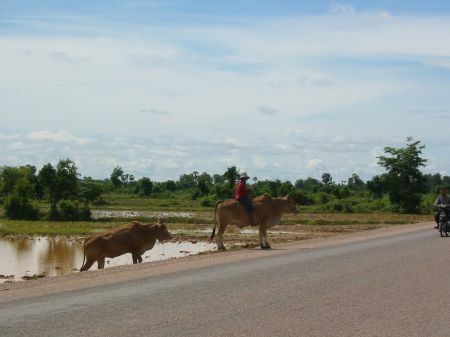 We were traveling on the national road 5 first to the north and than following its turn to the east which parallels the course of the river Tonle Sap. The place was well visited, with many children among the customers. There was a TV set in one of the front corners on which a Chinese movie was shown. This production was presented with Khmer dubbing and Chinese sub title. It was clearly fiction (with some cruel elements to it) and good fun. The population of this restaurant played close attention to the movie and everybody was laughing on many occasions. We had rice with various sorts of fruits and meat. The food was very good and really cheap. I managed to get only about halve of the customer in this picture. This picture was taken shortly before we left and only after our translator had asked people for permission. This is how it looks like outside the restaurant. On the opposite side of the street was a number of jeeps with a huge PA campaigning for I do not know which of the three big parties CPP, Funcinpec and Sam Rainsy. I could not understand it but what the person had to say was apparently taped, presented very loud and sounded rather aggressive to me. I did not want to catch these peopleâ€™s attention and avoided taking pictures of them. 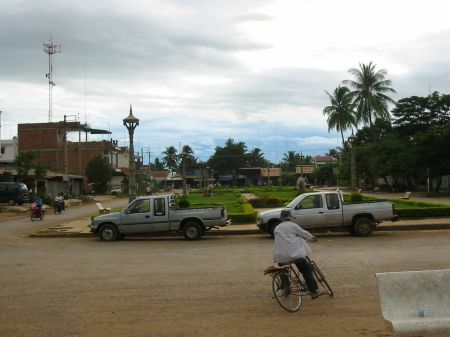 Our next stop was Kompong Chhnang, the provincial capitol of the province with the same name. 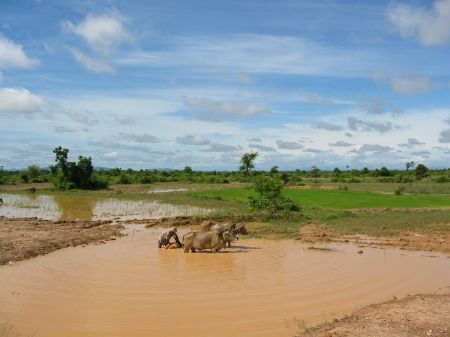 350.000 people are said to live in this province, which is located in the Tonle Sap basin. 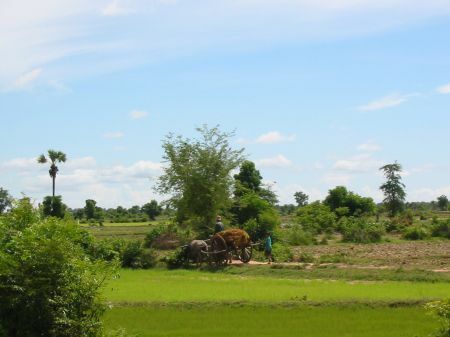 This is in some ways the heart of Cambodia, used to be part of the Chinese sea, and is extremely fertile. 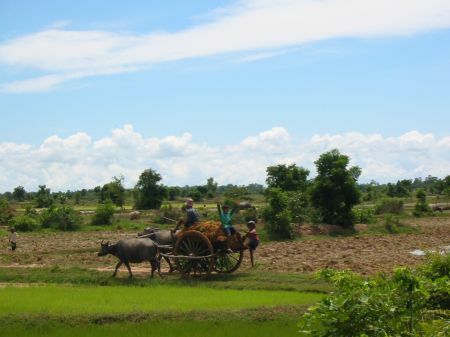 Only around here it is possible to harvest rice twice a year. 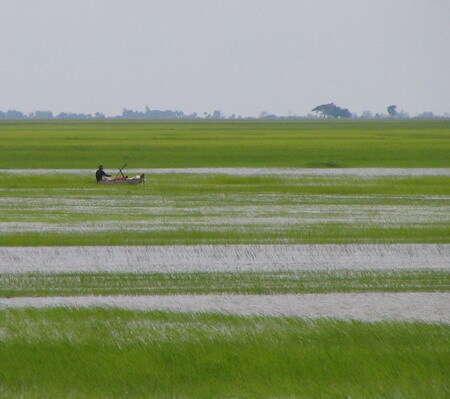 In the rainy season the Tonle Sap Lake extends its surface seven times. I read in my tourist guide that the port is a busy place and a good one to see. This is the water side. The mountains in the background are supposed to look like a woman who is resting on the ground. However, I did not manage to visualize her. Or she is incredibly pregnant, but I do not want to speculate about this. 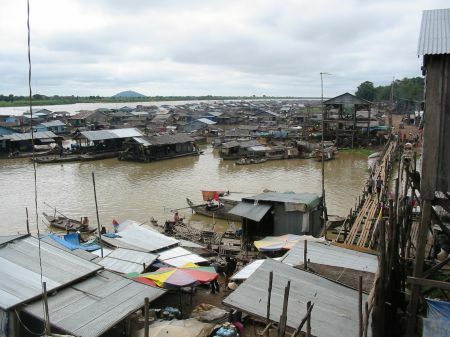 People here have adapted to the changing conditions of their environment and live largely in floating houses with which they do not settle permanently. This is about 2 km from the national road and we passed a number of busy places, among them spots were people where standing in the water, occupied with I do not know what but maybe fishing. This is the house front along the river. There are so many white Toyota Camry that it is hard to avoid having them in the picture. This was about 9 or 10 am. I observed that this is about the time when the monks walk in groups or alone through the streets asking â€“ actually begging – people to give. Down the street one can recognize a number begging monks coming. Usually they stop at some point and wait in line for people to contribute. I heard on several occasions that monks are not supposed to eat after noon. 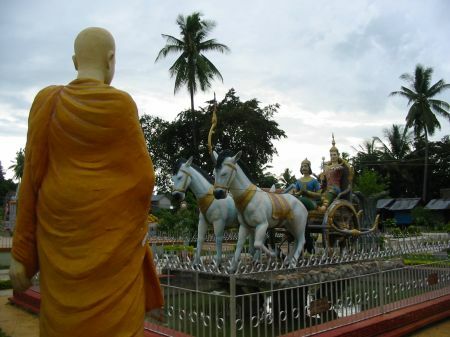 Furthermore I learned that it is common for male Khmer to become a monk for some time, which is actually considered a requirement to become a real man. I do not have verification on this one. And I heard that in the countryside (which is pretty much what this country consists of) this is mostly done during the dry season when there is not too much to do in the field. This is a good chance for education, too. 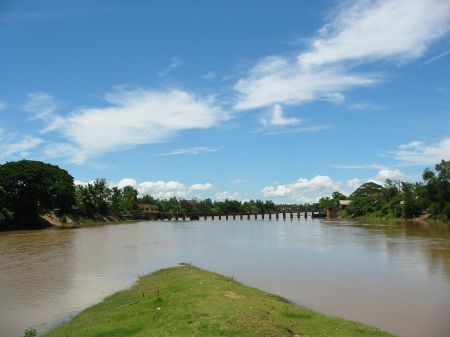 This is the Stung Pursat, a river which flows into the Tonle Sap. 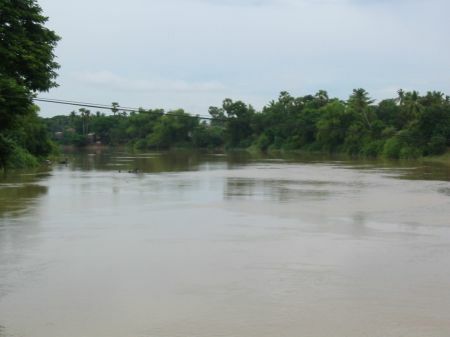 This picture is taking from one of the bridges in Pursat, which is the provincial capital of the province with the same name. 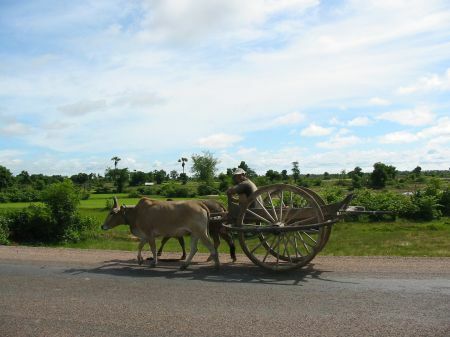 Pursat does not seem to offer too many attractions for tourists. Under the heading â€œSehenswertesâ€� (worth visiting) there was only one item in my tourist guide. Marble statues are manufactured and sold in this museum which actually includes a library as well. However, we found both closed. 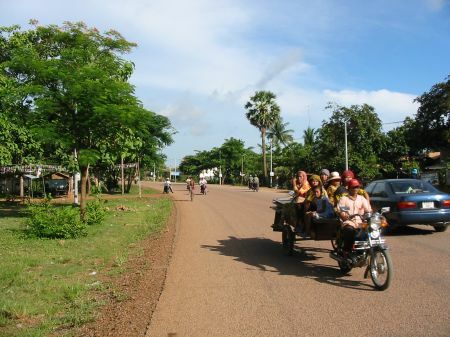 We stopped about 10 km before we reached Battambang, which is the provincial capitol of Battambang province. 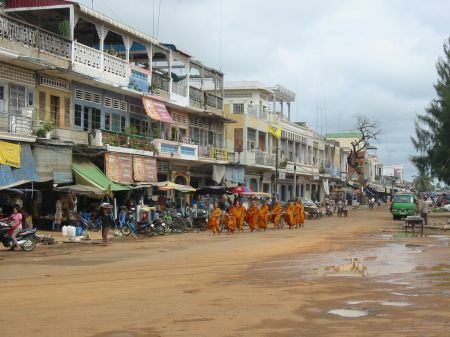 Battambang is with 300.000 inhabitants the second largest city in Cambodia. I heard this province is so fertile that it used to feed the entire nation. 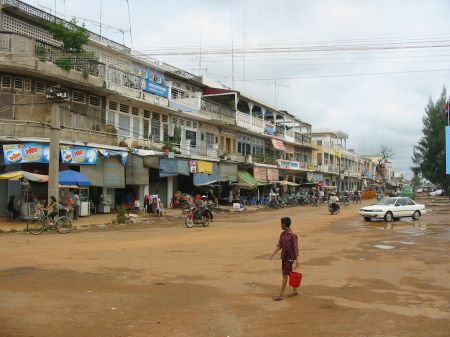 Accordingly, Pol Pot concentrated the implementation of his evil rural development strategy in this region. This is where we had lunch. The arrangement is characteristic. In the front, were the lady is standing, there are about 12 to 15 pots with various delicious kinds of food. Interestingly, one pays in locations like this per person. So one can order and eat as much and as many sorts of food as one wishes to. This costs like 50 cent per person but I am not exactly sure. Live appears to be rather laid back around here. 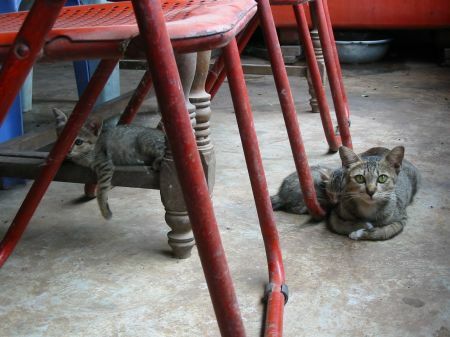 We went first to some family members of my co-travelers. 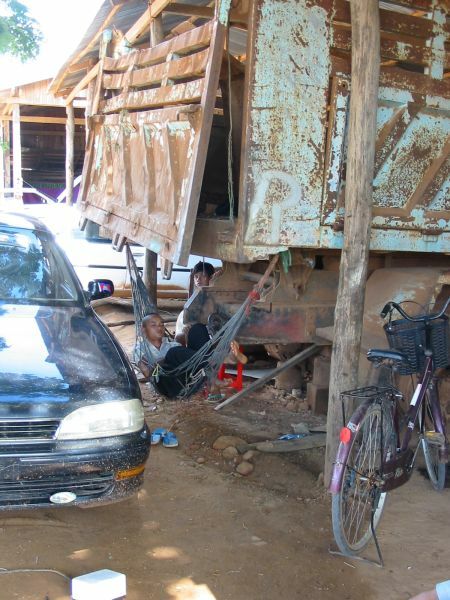 Those people live in a house in the outskirt of Battambang City. Their house is built on stilts made of concrete. 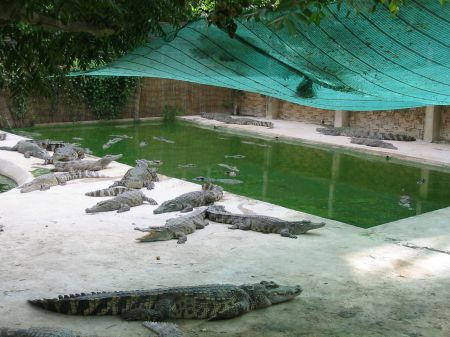 It is the better-off who can afford this kind of protection from flooding. Those people where very friendly and provided us with refreshments. Then we went to see the Islamic development people. Afterwards we went to see this place were a private entrepreneur raises crocodiles. Nobody was able to tell me for what purpose or what markets. However, this is not associated with the Muslim community. 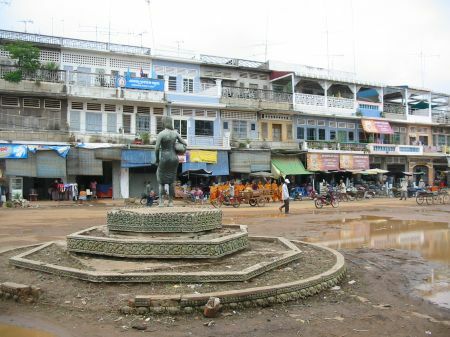 This is in the center of Battambang City, which is getting a new road. 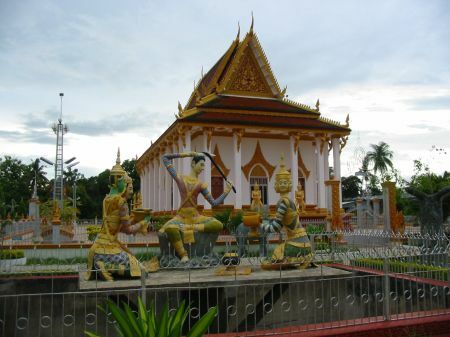 This is one of the pagodas in Battambang and there were many colorful statues all over the compound which represent scenes in the life of Buddha. This is â€“ obviously – when he is cutting his hair. Later on we went to visit some other friends of my co-travelerâ€™s family. These folks here live in very basic conditions. All of these women except for one are wage workers in very unstable work relationships. If they manage to get a job on a daily basis they get 5000 Riel (1.20 US$) per day for work on a construction side. The male to the right is the father of the three women in the middle. 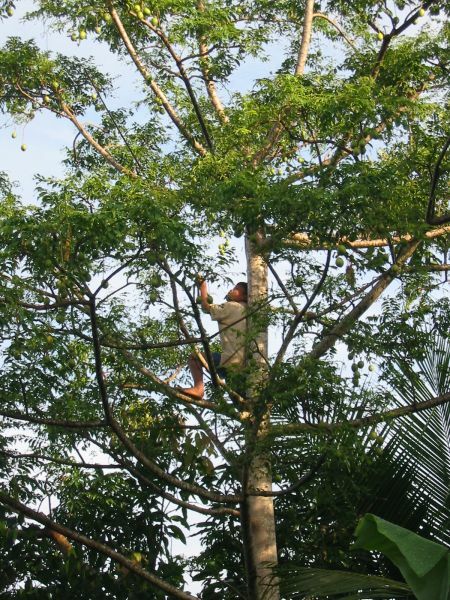 He is working in unstable conditions as well but I did not manage to learn what he is actually doing. We spend a good part of the evening on the bamboo rack in front, were we ate several fruits as some sort of snack. I did not know that lotus flowers have actually fruits which are really tasty (the green stuff in the basket on the rack). Another fruit is very common around here and very delicious but I would have a hard time describing how they look or taste like(the red stuff in the basket). 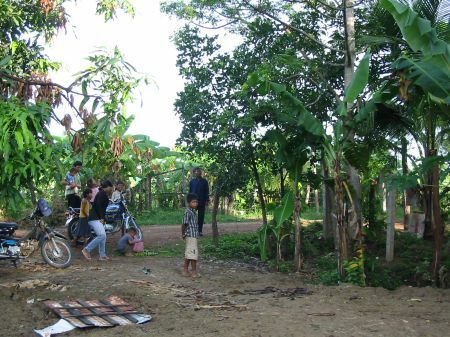 Even those people are considered relatively well off, since they manage to live in the outskirt of the city. However, their land does not allow for significant agricultural endeavors and they depend on wage labor. This shack is very simple. 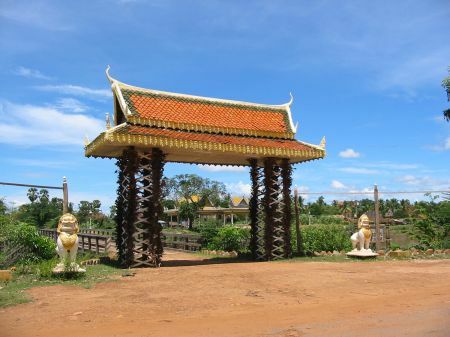 The base is from laterite, the structure from wood and bamboo covered with mats of straw. Other walls are covered with paper taken from magazines. There is a TV set inside. We spent a good part of the evening here and I felt really bad for not learning much Khmer so far. We then went to visit other friends and/or relatives. Their families spent years together in the border region with Thailand in order not to be subjected to Pol Potâ€™s nasty policies. These people appeared to be poor as well but willing to share what they have. We had good and opulent food. Than there was a long discussion in Khmer which I did not understand. It really was a pity to sit with these people and rely on a translator. 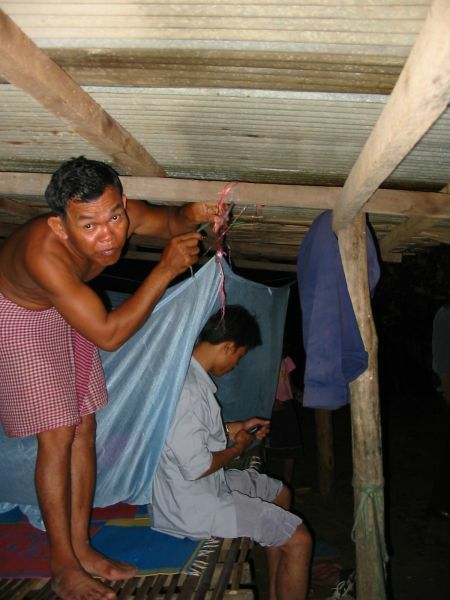 We spend the night on some mats on the bamboo rack under this mosquito net. Unfortunately I blinded this friendly guy with my flash. This is in the morning. 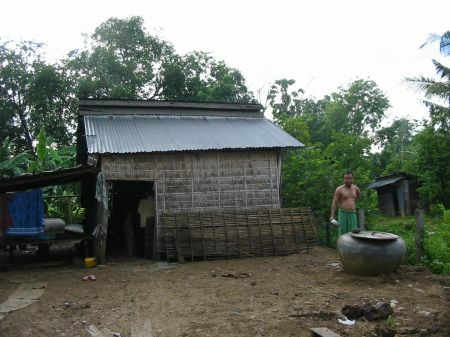 The huge tank to the right is used to keep water which is being collected from the rain via the roof. I saw these containers all over the place. Oddly, I had three issues yesterday which all involved these tanks in one way or the other. The first time was when we had lunch in this restaurant and I went out the backdoor to wash my hands. I found a number of these containers as well as soap and started to actually wash my hands in it. People around me became very nervous and I learned that I better use the bowl to rinse my hands outside the container. This was plausible to me but only afterwards. The second time was when we visited the first family in the evening. I removed my shoes â€“ like everybody â€“ in order to sit on the rack. After I ate some of the fruits I felt I should wash my hands. After all, by now I knew how to properly take care of that. So I went barefoot to the container. After I washed my hands just perfectly (while my co-travelers were proliferating my earlier misfortune) I wanted to sit on the rack again. I realized only now that my feet were pretty dirty after this short walk. They were wondering how I would sit on the rack without my feet touching it and gave me a sheet. While I was politely listening to their jokes (which I could not understand) our translator indicated that I could dry my hands with the sheet now. This was a good thing because I was about to clean my feet with it. The third time was in the late evening when people started to have a bath. Our driver tried to explain to me how to properly go about it. This involved a lot of towels. So later on I went to the container, which was not the one in the picture but another one behind the house almost in the forest. So when I was standing in front of the container and it was entirely dark in this forest I felt I better just remove my clothes and give myself a good number of showers with this bowl and then put on my fresh clothes. The driver was wondering later on how I got a bath with only one towel and I told him. He was shocked and indicated that it would have been quite inappropriate for me to meet somebody naked, regardless of both forest and darkness. Which fortunately did not and I think was not likely to happen. In the picture he is having a bath the proper way. You get dressed in this sort of cloth which allows you to decently get rid of your underwear. Next thing is you take the bowl and start rinsing water over your body which he is (rather: pretends to be) doing in the picture. This can be accompanied by more or less enthusiastic endeavors to catch some water and actually wash your body with the hand not occupied with the bowl. When you think you are clean enough now you start to dry your skin with another towel before you start getting decently into your set of underwear while trying to manage to keep it dry to some degree. I saw people having a bath in a similar way standing in a river or lake or even pond which I believe is more effective than the next-to-the-container option. After he finished he suggested I should have another bath. I though I better do not practice this in front of the house right now in the daylight. This guy was causing the fruits of this tree to fall by beating at the branches with a stick. This harvest got some attention from neighbors and passengers. 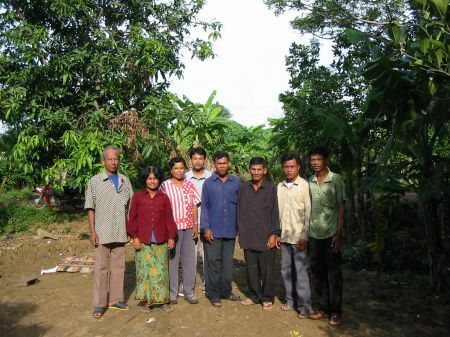 Those people have spent long and very difficult years together in what they refer to as â€œThai border regionâ€�. 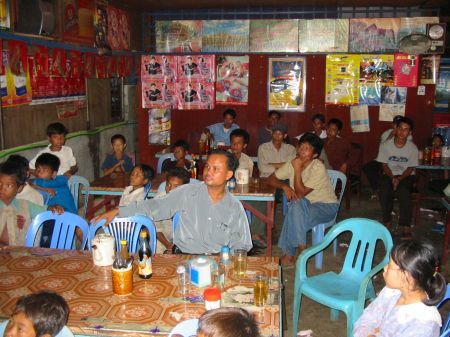 This was when Pol Pot ruled the country and they lost many relatives and friends. Shortly after this snap shot we left. We went to see the market but did not spend much time. 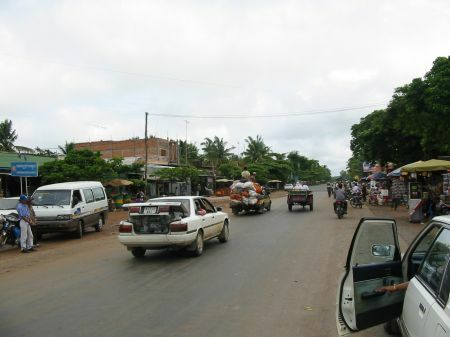 Then we left to drive back to Phnom Penh. The elderly guy in the left of the picture had to travel back to the very east of Cambodia and we gave him a right to Phnom Penh. This is how the street looks like in the morning. 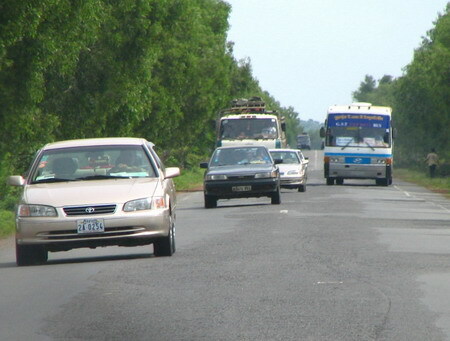 The vehicle upfront is a very common sight on any major road between the â€˜urbanâ€™ centers that I have seen so far. This is just a cart attached to a moto cycle. Very often I saw up to 16 and more people sitting on such a cart and traveling with high speed. I believe this really is very dangerous and only on occasion see people traveling like this with a helmet on. In the background is the unavoidable Toyota Camry. After we have been traveling for about 1 hour the engine stopped operating. Although the starter was working the engine did not move the car a bit. 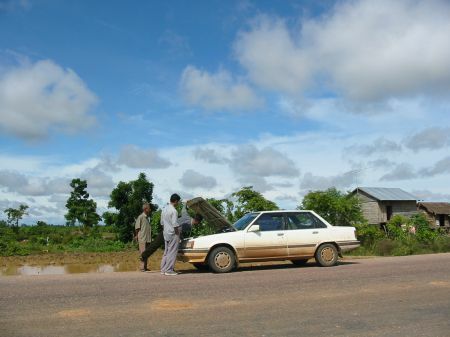 We tried a couple of times to push the car to get it started but it did not work out. 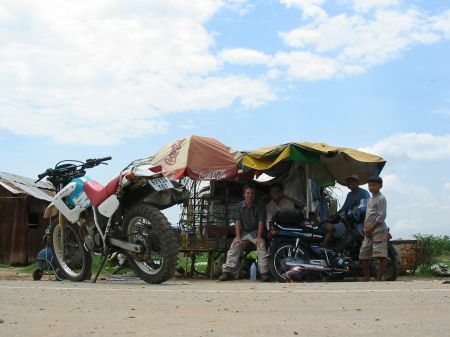 There was not much we could do about it and our translator hoped on a moto and went back to the next village to get a mechanic. This took about one hour and gave us the chance to hang out in the sun for a bit. And I got the chance to sneak around and take some pictures. 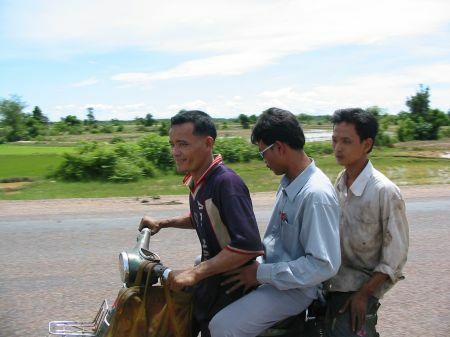 All sorts of people are traveling with various sorts of vehicles and very diverse speed levels. This is a very characteristic image. The black car (a Toyota Camry) is overtaking a truck, which is itself traveling with quite high speed. I hope it can be recognized on this picture that the black car does not have a plate. However, the driver has set the winker. The white car behind the black car is another Toyota Camry. The driver of the white car is going to overtake the black car even before both reach our white Toyota, which is standing on the street. These cars are closer than it appears on this small picture and all involved cars except ours where traveling fast. So I took this picture and left the road to save myself. 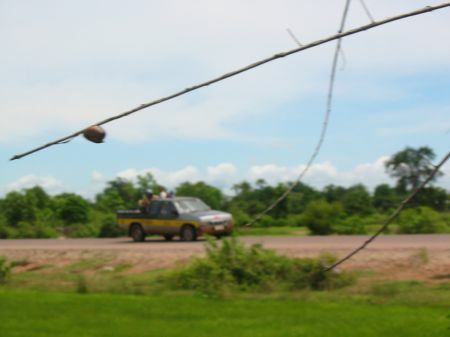 In the absence of any enforceable speed limit the limit is set by the driversâ€™ level of carelessness and to a lesser extend by the quality of his carsâ€™ shock absorbers. The absence of plates does make it difficult to enforce speed limits and would need to be addressed first. Another obstacle to the enforcement is that most of these speeding cars are Toyota Camry, most of those Toyota Camryâ€™s are white and most of the rest is black. I saw a white Toyota Camry which was speeding like hell. It did not have a plate but at the platesâ€™ rightful place a sign reading â€œCamry Sportâ€�. I really believe intelligent enforcement would provide the governmentsâ€™ very limited budget with significant additional income. People who own cars and can afford to drive them can be considered very well-off. And what they are doing here is putting other citizensâ€™ lives at risk. The core of the problem might well be that the people in charge of enforcement have no incentive because it is them who can afford cars. Just like our car was similar to those ones we were traveling in the same spirit. I would have felt much better with a helmet but I could not even find a seat belt. 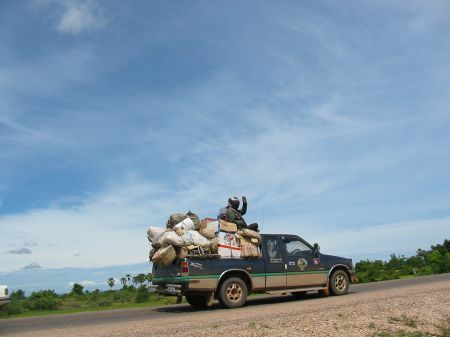 â€œNo useâ€� is how my co-travelers commented on my failure to find a seatbelt. This is most likely true insofar the belt would not make much difference in a frontal crash with another speeding Toyota Camry. The road was â€“ like this one â€“ on many stretches of our journey good quality. On those parts of the road driver of cars speed up to the limit of their vehicles. This is like a national competition. So there are many vehicles on the road that we had to defeat. What really gave me a thrill is that with the steering wheel on the right each of those overtaking operations involved the other front seat passenger. This person had to give the signal on which the driver would turn blindly to the other side of the actually not very wide road. This is another notorious species. Those trucks are frequently loaded with incredible numbers of people who only occasionally wear helmets. However, I doubt this measure would make a big difference given the speed with which they travel and the vulnerability on the back of the truck. The fact that the picture is blurry despite the bright day light shows just how fast those people travel. Most people did not mind me taking pictures of them. Some time later the translator was back with two mechanics. Those guys take their job serious. It is clear from the beginning who pays and who gets dirty hands here. They found that some sort of transmission band was broken. 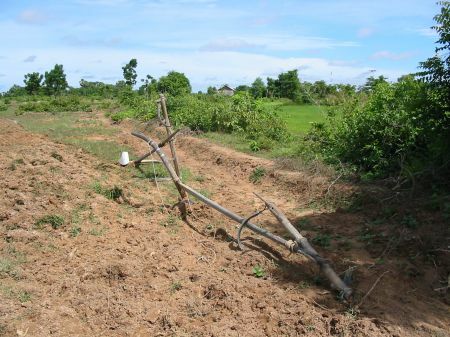 This part as well as the necessary tools are not available in the village. 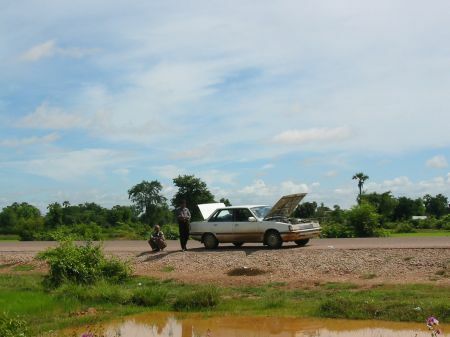 We decided the best way to go about it was to have the car pulled to the next town, which was Pursat with about 16 km. So they went back to the village to get a truck. This gave me more time to explore the environment. Rather robust technology is being employed to work this soil. The part which actually digs into the ground is made of steel. 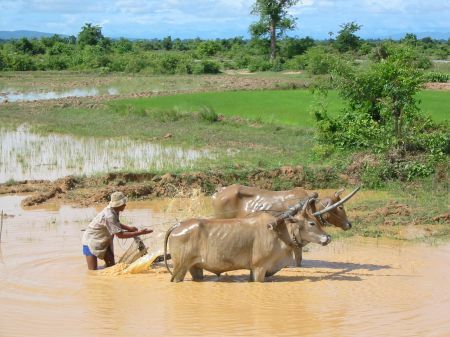 I saw peasants in Ethiopia using a very similar arrangement but a wooden shovel. I am a rather urban person and really do not know anything about agriculture. But I can easily imagine that the steel shovel does not use up as fast and might well dig deeper in the ground. This is the cooling system. 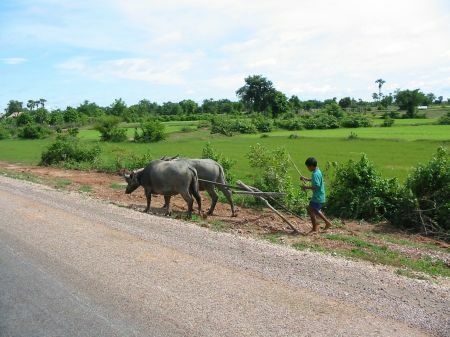 Those folks were passing our car several times on the road and than turned and disappeared somewhere in the fields. I gave them a bright smile the first time and they returned every time they appeared again. 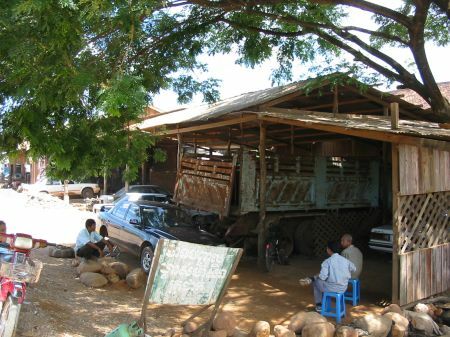 This is the garage where we finally found somebody who was willing to take care of the car. This was Sunday. We went to a Khmer restaurant to have some food. Again there was a TV. A short movie was running which obviously was meant to make voting on election day (September 27) appealing to the population. This spot was about 20 minutes long and explained step by step how to cast a vote. Mainstream citizens were presented who â€“ with Khmer pop music in the background – proudly went to the polling station to submit their vote. 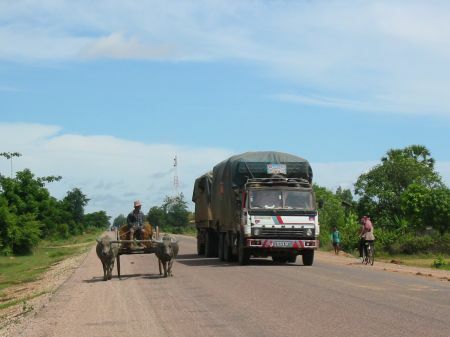 Afterwards the entire community â€“ including policemen, moto driver, women and so on â€“ goes ceremonially behind a cart on which the ballot box is moved to the authority to undergo the counting. I found this not to bad and learned in the end that this spot was produced with the assistance of GTZ. 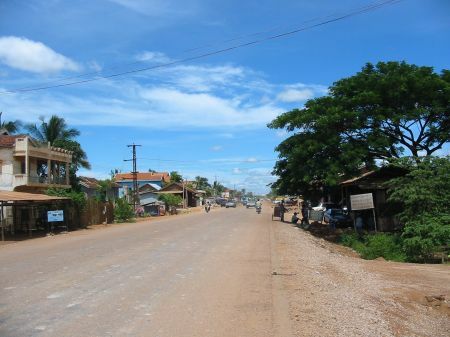 By the time we got back to the garage there was still no significant progress and I pushed the translator to go on a moto tour to find out whatâ€™s going on in Pursat. The museum was still closed. We went to the river and met two boys who wanted to practice their English. They told us that there is an island in the river which might be worth visiting. This is the entrance to the â€œgolden ship islandâ€�. It is called like this because it has the shape of a ship and supposedly emerged after a golden ship sank here. There are at least three motives in this picture which are very prominent in the local architecture. This is the lion, the shell-like ornament behind it and the roof of this small stage in the back. Some variation of those can be found everywhere. Most temples carry a roof like the one in the back and even the Ministry of Interiorâ€™s main building has gotten a very similar one. 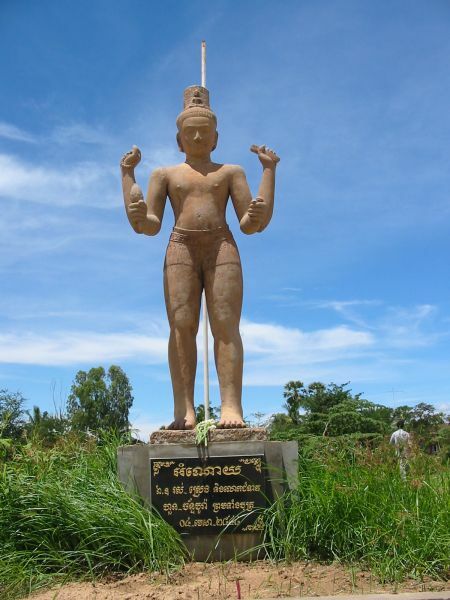 Vishnu is â€“ behind Buddha â€“ very often represented in statues. 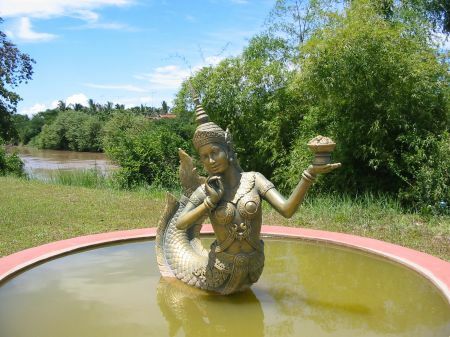 In contrast, females are seldom immortalized in statues. So I am particularly happy that I can provide the following picture of at least halve a female which I though was a good thing for a change. This is the northern tip of the island. There are a few bridges over this river but only one appears to be capable of carrying cars. At the banks on both sides of the river people are doing their laundry and going for a bath. I did not see a single tourist in this town and do not expect this to be dramatically different on other days. 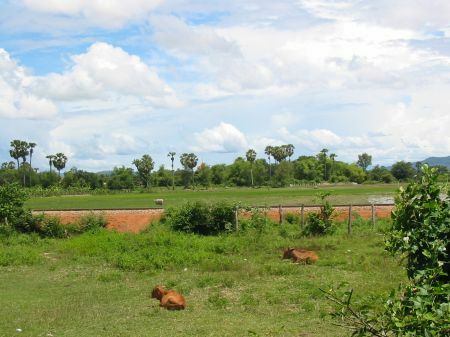 So this island was not busy at all and we found only two boys in hammocks observing two cows grazing. Then we went back to the garage, which was not very busy, too. 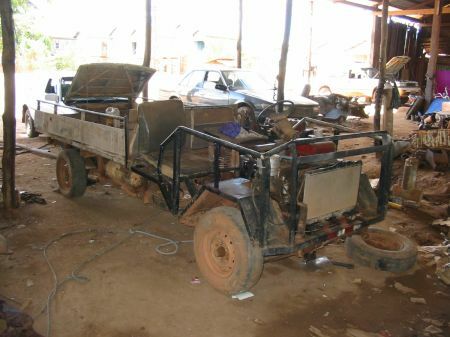 I beg this improvised truck is powered by a generator which returned from the death. There was not much to do and we started exploring the surrounding. Behind the garage are a few cows. And the rail road track passes here. 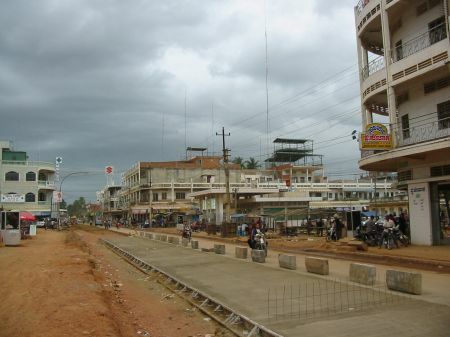 The train goes from Sihanoukville at the coast all the way up to Battambang and Sisophon. 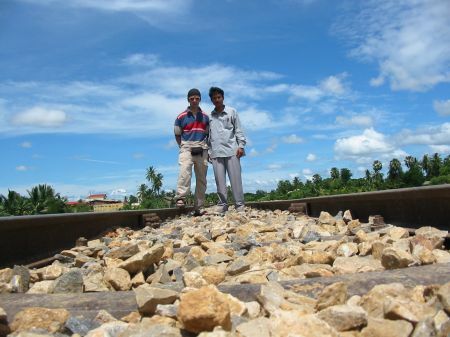 From Phnom Penh to Battambang alone (300 km) it takes this train 2 days I heard. In the center of the picture the roof of a pagoda sticks out behind the trees. I do not know what those children were trying to catch because they did not catch anything. I felt sorry for them. There are two huge buffalos in the background. We went back and took the shortcut through some peopleâ€™s property. On the way we passed this shanty. The translator said something to these youngsters and ensured me they would not mind me taking a picture. Maybe I should mention that he does not consider it very important to ask for permissions in the first place. I think these kids did not realize what happened until I actually took this picture and they had not much opportunity to move. This picture is worth studying. 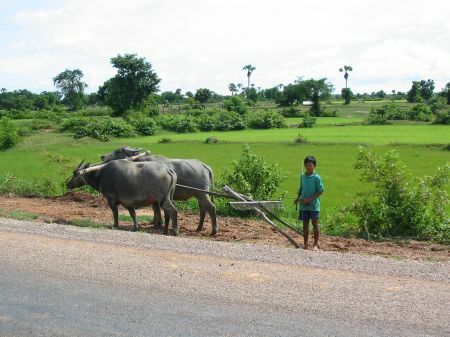 This truly is a representation of Khmer gender roles at their best. 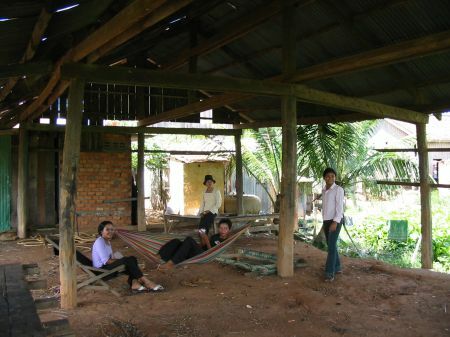 All persons in the picture are female, except the guy in the hammock. It is very uncommon (rather: indecent) for teenager to have a girl (boy) friend and if this happens (and is shown in public) this means a serious commitment, particularly by the guy. So it was not very surprising that this Khmer guy did not like the situation too much. His accompaniment was eager to take more pictures while he displayed strong displeasure with the idea of being in the same pictures with them. The girl to the right lives in the house to the left in the background while the other girlâ€™s family lives in the house to the right. Finally the car was ready again and we had to pay just 20 bucks. Given that this was Sunday and that the spare part was about 12 US$ this really appears to be a modest price. Since we were behind schedule we had to speed even more afterwards. So I did not get the chance to take any more pictures. We arrived in Phnom Penh when it was about to get dark.